The arrival of Donald Trump in the White House was greeted by the Israeli right with enthusiasm. They believe that it heralds a new era of settlement expansion in the occupied territories. The Israeli government appeared to think so too, welcoming Mr Trump's victory with the announcement of permits for new housing units in both East Jerusalem and the West Bank. Last week, on a visit to the strongly nationalist and religious settlement of Beit El, north of Jerusalem - close to the Palestinian town of Ramallah - I saw something of the excitement that Mr Trump's victory has created. The word "settlement" suggests something new or provisional. Beit El looks more like a small suburb. It was founded some 40 years ago and today has a population of over 7,000. Situated much further east than many other settlements, it has always been assumed by advocates of a two-state solution that it would have to be given up if there was an agreement. I met Biblical scholar Hagi Ben Artzi, who has lived in Beit El for some 38 years. He told me that he hoped that "a new era" was beginning. He blamed a shortage of new homes there on the Israeli government's failure to stand up to President Obama. And he welcomes the Trump presidency, hoping it will back a programme of vigorous settlement expansion. He appeared to have good reason for his optimism. He took me to the synagogue of the Yeshiva, or Jewish religious college, in Beit El, where dozens of young men were busy saying their evening prayers. The synagogue was a new and airy building. Money for at least part of its construction, Mr Ben Artzi told me, was donated by David Friedman, the man chosen by President Trump to be Washington's new ambassador to Israel. Mr Friedman is not the only supporter of Beit El in the new administration. So too is Mr Trump's son-in-law and confidante Jared Kushner, the man the new president believes can deliver an Israel-Palestinian peace deal. President Trump's apparent tolerance of renewed settlement construction poses some immediate problems for Israeli Prime Minister Benjamin Netanyahu. During the Obama presidency, Mr Netanyahu tried to walk a narrow line between the maximalist demands of right-wingers in his own cabinet and pressure from Washington to curtail any actions that might make a renewal of the peace process more difficult. In a sense the Americans provided a pretext for Mr Netanyahu to resist the more ambitious demands of the Israeli right. With the arrival of Mr Trump, the prime minister looked dangerously exposed. But maybe not. The Trump administration's policy appears to be evolving. Like in so many areas there is as yet little clarity. But the latest White House statement suggests that the president wants, at the very least, to give Mr Netanyahu reason to dampen the construction ardour of his opponents on the right. "The Trump administration has not taken an official position on settlement activity," says the statement, and while it notes that the administration does not "believe the existence of settlements is an impediment to peace", it does underline that "the construction of new settlements or the expansion of existing settlements beyond their current borders may not be helpful in achieving" a peaceful resolution to the Israel-Palestinian dispute. Settlements are of course not the only controversial issue on the US-Israel agenda. 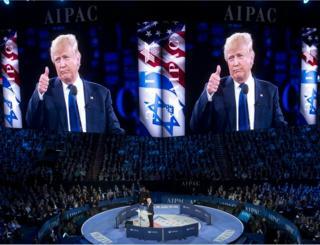 On the campaign trail Mr Trump announced with much fanfare that he would move the US embassy from Tel Aviv to what he described as "the eternal capital of the Jewish people, Jerusalem." Other presidents have made similar statements in the past but have always found reasons to postpone following through on their promise. This is because while Israelis regard Jerusalem as their capital, this is not the view of the bulk of the international community, which sees the status of the city as an open question, to be decided in eventual peace talks with the Palestinians. At the annual security conference in Tel Aviv, Philip Gordon, a former co-ordinator for the Middle East in the Obama administration, told me that moving the embassy would be a serious mistake. "There is a real risk," he told me, "that it could not only create demonstrations which could potentially turn violent, not just in Jerusalem but in Muslim capitals all over the world." He feared that "it could interfere with the burgeoning strategic co-operation between Israel and a number of Arab partners" like the Saudis and other Gulf states, who are today closer to Israel in their strategic outlook given their common fear of rising Iranian power. Mr Gordon also feared that it could interfere in economic relationships between Israel and Jordan. Moving the embassy would please Israelis but would risk undermining the Israel-Sunni accommodation focused on Iran and also bring the Israel-Palestinian issue back onto the front burner at a time when there seems little chance of any real progress towards peace. So much for the difficulties. One area where there is unlikely to be any great change is in the fundamental strategic and military relationship between Israel and the US. As Michele Flournoy, head of the Center for New American Security in Washington and a former senior official in the Pentagon, told me "at the very end of the Obama administration the United States and Israel signed a 10-year memorandum of understanding which ensures that the United States will give Israel $4bn of military assistance each year. I don't think President Trump will upend that commitment." Mr Trump though - certainly when speaking of America's Nato allies - has insisted that they all pay more for their defence. So Ms Flournoy noted that there was "some tension between the strong commitment he's made to Israel and this notion of America First 'we're not going to pay so much for our allies and partners anymore'." On broader regional strategy, Mr Netanyahu and Mr Trump are soul mates in their hostility to Iran. Its growing regional influence, after its successful intervention to bolster the Syrian regime, makes it and its allies like Hezbollah, Israel's number one security concern. Like Mr Trump Israel opposed the nuclear agreement with Iran. But senior Israeli security officials - like their counterparts in Washington - have indicated that it might better to allow the deal to remain, despite its perceived imperfections, and to focus instead - maybe with Russia - on constraining Iran's burgeoning influence in the Middle East. But what of the wider relationship between Mr Netanyahu and the new man in the White House? Veteran diplomat Itamar Rabinovich, a former Israeli ambassador in Washington, argues that the relationship between the two countries can be crucially influenced by the chemistry between president and prime minister. "The negative chemistry between President Obama and Prime Minister Netanyahu," he told me, "had an adverse effect on their relationship but did not, for instance, affect a very tight security relationship." On the face of it, Mr Netanyahu and the new president appear to be getting along just fine. They will have their first official meeting towards the middle of this month. But given Mr Trump's mercurial personality it would be a brave man who sought to guarantee that the relationship between prime minister and president will always be trouble-free. There are other factors in the mix. One that is little discussed outside Jewish circles is the ever-more complicated relationship between American Jews and Israel. Most of them did not vote for Mr Trump. And while they remain strong supporters of the Jewish state, many are fearful at the rightward drift in Israel and indeed in their own country. Underlying this is a denominational issue - most US Jews come from the progressive strands of the religion - but the Israeli government does not defend their interests, because it seeks to placate the Jewish Orthodox establishment in Israel. Rabbi Eric Yoffie, a former head of the Reform strand of American Judaism, told me that "these differences are already leading to an erosion of support for Israel because of religious issues and religious extremism in Israel. I think this is deeply troubling", he says. "In some ways," he adds, "it is more important than the political differences having to do with peace and settlements and so on." In my week-long trip to Israel I came away with a pervading sense of unease, even among the most enthusiastic supporters of the Trump presidency. Nobody knows quite what he will do. Former Ambassador Rabinovich summed it up rather well: "Oftentimes I'm asked what do I want to see in American politics? I say first and foremost I would like to see a first rate American president keeping America in great shape. We all need America," he stressed. "The world needs America to manage the international system. Israel needs American support and for this to happen effectively America itself needs to be in good shape. And what worries me is President Trump's ability to lead and manage America on a first-class basis. This is yet to be seen."